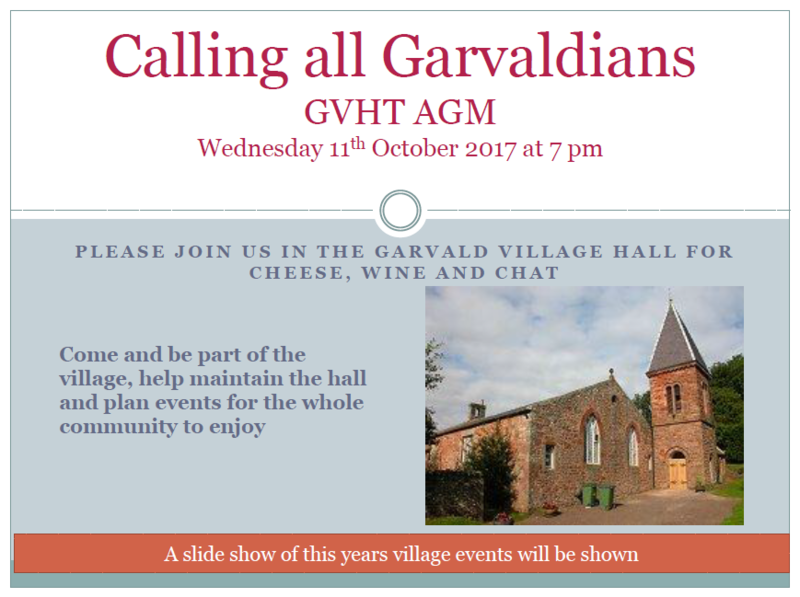 The Garvald Village Hall Trust AGM is on Wednesday 11 October 2017 at 7pm in Village Hall. Come and join us for some cheese and wine and see a slide show of Village Events over the past year along with some historical images of the village. 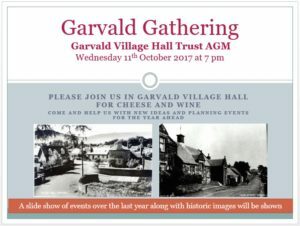 This entry was posted in Garvald Village Hall Trust on September 29, 2017 by Admin. The Lammermuir Festival is visiting Garvald this year to play Bach And Buxtehude on Sunday 17 Sept 3pm, at Garvald Village Hall, with Huw Daniel, Alison McGilvery and Jan Waterfield. This entry was posted in Events, Garvald Village Hall Trust on June 5, 2017 by Admin. Come to the Spring Table Top Sale on Sunday 14th May, 12-4pm. Tea and cake will be served. If you’d like to book a table (6×3′ at a cost of £8), please use the contact form or let Freda know. Proceeds raised from this event will be going to Garvald Village Hall and to charity. This entry was posted in Announcements, Fundraisers, Garvald Village Hall Trust on April 16, 2017 by Admin. Well done to you all! This entry was posted in 100 Club on October 23, 2015 by KM. We appreciate you all lead busy lives and suffer from many competing priorities, but it would make such a difference if there was a good turnout at tomorrow’s Hall AGM. It’s at 7.30pm, and there will be cake, biscuits or both! Please PLEASE *PLEASE* try spare an hour or so of your time. This entry was posted in Garvald Village Hall Trust on October 20, 2015 by KM. A wee reminder that it is the Hall AGM a week on Wednesday – 21st October at 7.30pm. So please, dairy the time and the date. An hour of your time next week, could help set up the Hall for another two years. That’s two more Halloween parties, 100 more post offices and over a 1000 games of table tennis at the very least! This entry was posted in Events, Garvald Village Hall Trust on October 13, 2015 by KM. This entry was posted in Garvald Village Hall Trust on October 1, 2015 by KM. Please make a note in your diaries of the forthcoming AGM. It’s on Wednesday 21st October at 7.30pm in the Hall. More details to follow, but save us the date if you can. Many thanks in advance. 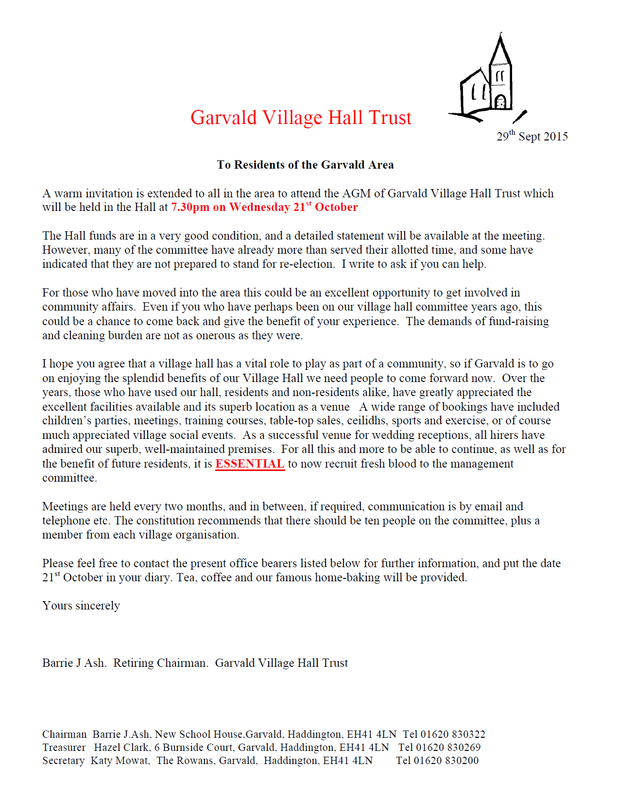 This entry was posted in Events, Garvald Village Hall Trust on September 29, 2015 by KM. July – 21, Ian McMullan; and 44, Tom McGill. August – 61, Tim Flynn; and 12, Phillip White. Well done, cheques on their way! This entry was posted in 100 Club on August 12, 2015 by KM.